Oh, the power of the Internet. And the power of Facebook. 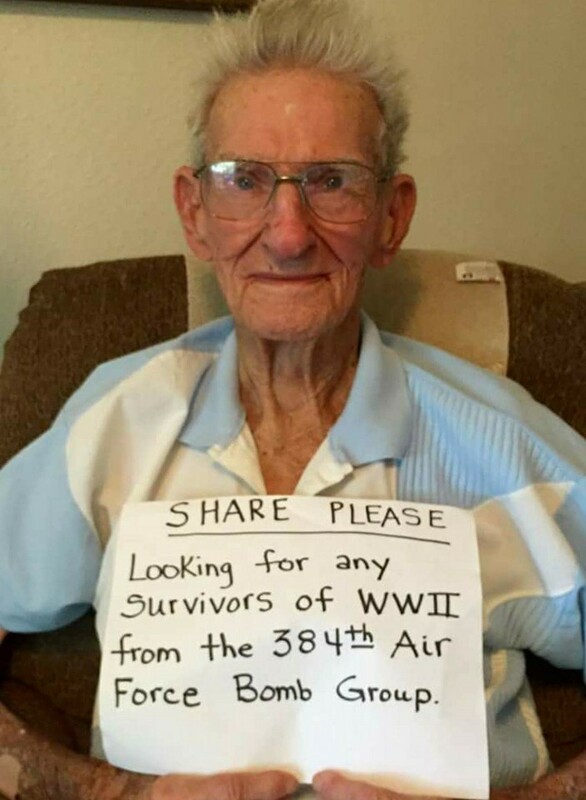 A 384th Bomb Group veteran named Delbert Storm wanted to find other surviving veterans of the group. His daughter posted this picture of him on Facebook. He asked for shares and he got them. Last Fall, the picture found its way to the 384th Bomb Group’s Facebook page – many, many times. The picture is still being shared on Facebook, and still being shared with the Group’s Facebook page. (You can all stop now – he found us). 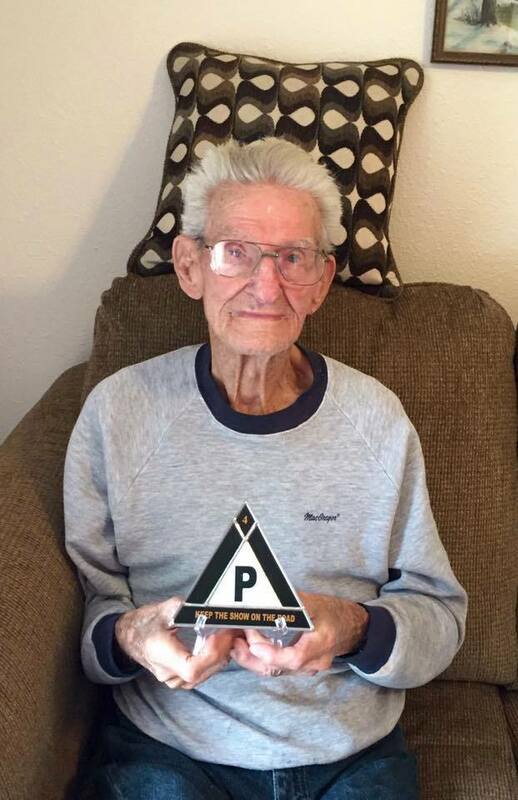 Staff Sergeant Delbert Storm was a ball turret gunner with the 384th’s 547th Bomb Squadron. 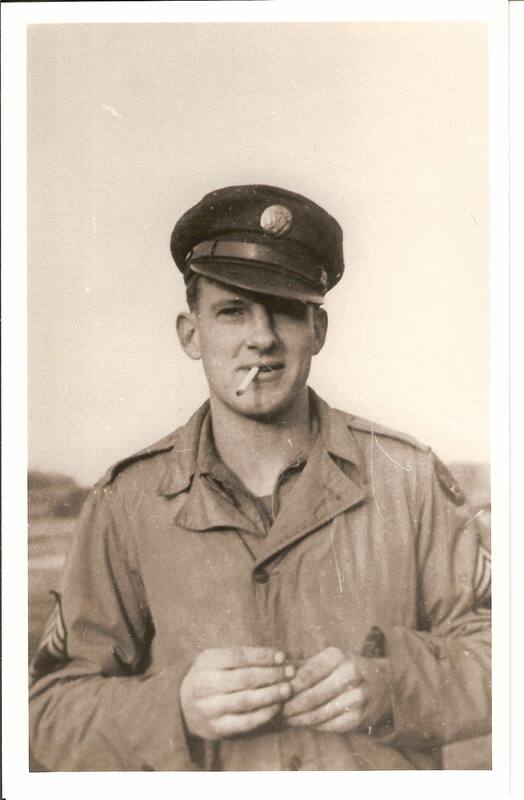 He was assigned with the Edward A. Sienkiewicz crew on AAF Station 106 Special Orders #146 on July 24, 1944, just two days after my dad, George Edwin Farrar, was assigned to the group with the John Oliver Buslee crew. I doubt they ever crossed paths as the Buslee crew was assigned to the 544th Bomb Squadron. The Sienkiewicz crew and the Buslee crew also flew the same first mission – August 4, 1944. Delbert survived four-plus months of one of the most dangerous places to be in a B-17 – the ball turret, which hung from the belly of the plane. He completed his thirty-fifth mission on December 11, 1944 and earned his ticket home. Despite flying his first thirty-four missions as a ball turret gunner with the Sienkiewicz crew, Delbert flew his thirty-fifth as a flexible gunner with the Merton D. Klatt crew. Edward Sienkiewicz had completed his tour on December 9, leaving Delbert to complete his last mission with a different crew. While Delbert Storm has found his group, I don’t know if he has actually found any survivors that he actually served with on a mission or any of those that were in his original crew. If you recognize any of the names on this page as an elderly (in his 90’s by now) friend or relative that served with the 384th Bomb Group at Grafton Underwood, England, please e-mail me or post a message to the 384th Bomber Group’s Facebook page (you’ll have to join the group before posting). Thank you, Mr. Storm, and welcome back to your group. We’re thrilled that you found us. By thearrowheadclub in 384th Bomb Group on January 6, 2016 . Hi Mary Alice. I am glad to see more NexGens, you and your sister, connecting with us on Facebook. Mary, I have added a comment in the 384th Bomber Group Facebook group tagged to his daughter, Vicki Beebe, which is the only method I have to contact him. You can post something and tag her, or message her through Facebook, too. You may be able to obtain a squadron list from NARA. The national archive data base. Missouri. Then from that list you could do facebook or google name search for possible matches. I hope this helps you reconnect with your brothers in arms.